If you’re like me, living outside the east coast tide waters, the word “diamondback” elicits an image of rattlesnakes. I have nothing against high-proof cocktails, but the original Diamondback had nothing to do with rattlesnakes, and wasn’t at all about high-test ingredients. And in this case, I consider the original to be better balanced—and much easier drinking—than the heavy-handed modern interpretation. And it’s not so much about the alcohol; rather, it’s the Chartreuse. That strongly herbal liqueur is notoriously dominating and difficult to blend with, and certainly is not to everyone’s liking. And the intensity of the 110-proof green version just compounds the problem. Known originally as the “Diamondback Lounge Cocktail,” the Diamondback was the house cocktail of the Lord Baltimore Hotel’s bar. In Baltimore, as on much of the east coast, the word “Diamondback” is not about snakes. Instead, it denotes the diamondback terrapin, as any University of Maryland ‘Terps fan can attest. The Diamondback Lounge and its Diamondback cocktail pay homage to their local turtle, the Maryland mascot. Shake all ingredients with ice until cold; strain over ice in a rocks glass, garnish with mint. Typical modern interpretations of this recipe specify Rittenhouse 100 rye, Laird’s bonded (100-proof) apple brandy, and 110-proof Green Chartreuse; Saucier (and the Diamondback Lounge) apparently had no such high-test idea in mind; they specified no brand names for the rye and brandy, and were very specific about using the sweeter, lighter 80-proof yellow Chartreuse. My guess is that the original, as a hotel bar flagship cocktail, was probably made with mostly 80-proof spirits. Stir all ingredients with ice until well-chilled; strain into a chilled cocktail stem, or into a rocks glass over ice. Optionally, garnish with a cherry. The whiskey: Another reason to go with the 100-proof Rittenhouse bonded is because this drink does need a whiskey with a strong backbone to stand up to the other flavors. An 80-proof rye is sort of a wallflower in the company of a flavorful apple brandy and the Chartreuse. The apple brandy: I used an Iowa brandy, Cedar Ridge. The original recipe calls for applejack, and therein lies a tale. Applejack has a long history, the important part of which is that by the early twentieth century, the term “applejack” seems to have been reduced to a slang term for apple brandy. (In fact, US Federal regulations don’t differentiate between the two.) The most commonly available “applejack” product is Laird’s Applejack, which is essentially neutral spirits (street name: vodka) blended with about 35% distilled apple brandy. That is not the applejack that Saucier refers to in his recipe, since Laird’s blended product didn’t even exist until the 1970s. Saucier would have been referring to proper apple brandy. One of the nice things that has happened in the last decade or so is the resurgence of American brandies, particularly fruit brandies. There are good apple brandies being made in many parts of the country (some even calling themselves “applejack”); I recommend that you try to find local or regional spirit for the Diamondback. Johnny Appleseed would be proud. The Chartreuse: Chartreuse is the critical element of the Diamondback. Saucier specified yellow Chartreuse, which is a strongly herbal, but not as assertive as its green brother. The yellow version is an 80-prooof liqueur sweetened with honey. 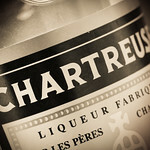 The Chartreuse provides two elements to the drink: sweetness and herbality. I’ve found that I enjoy the Diamondback more if I cut the Chartreuse back a bit, to a half-ounce; this reduces the sweetness, and holds the herbs in check, balanced with the whiskey and the brandy’s fruit. The… bitters? Yes, I know, there’s no bitters in the original. And you should leave them out if you want to make a proper Diamondback. But on the other hand, this is definitely an Old-Fashioned, and bitters love Old-Fashioneds. The elegant trick of the Diamondback, of course, is that the Chartreuse supplies both the sweetness you expect in an Old-Fashioned, and the herbs that (arguably) stand in for the standard bitters component. And it sort of works. But I believe the Diamondback is improved by the “barkiness” of standard bitters. One or two dashes of Peychaud’s seems to do what bitters always do, pulling the flavors together and giving the drink a bottom that is completely missing otherwise. The garnish: The original specifies a mint sprig garnish. I can’t imagine what they were thinking; mint just doesn’t work with the Diamondback. Some of the modern listings suggest a cherry; I’m okay with that, though it doesn’t really seem to add much beyond a point of visual interest. 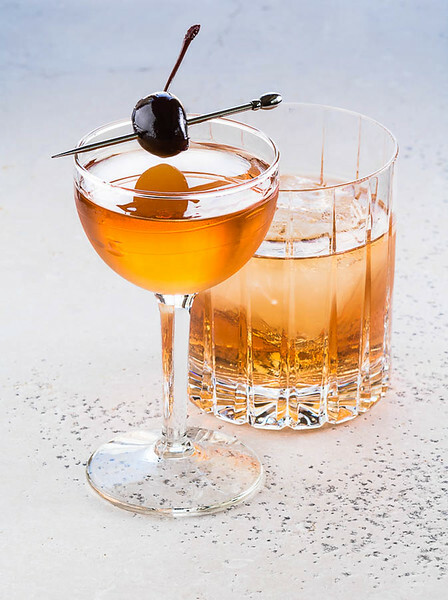 I suggest a cherry if you’re serving the Diamondback in a cocktail stem, and omit garnish if you’re serving in a rocks glass. In the end, adding the Diamondback cocktail to your rotation will depend on your acceptance of the idiosyncratic Chartreuse. Those who are used to aggressive flavors, especially bitters and herbs, may welcome the more modern interpretation. I, for one, regret the progression toward the hundred-proof mouthful of herbs, and away from the complex and elegant cocktail originally served across the Diamondback Lounge’s bar. So here’s to the memory of the unknown Baltimore bartender who first formulated the Diamondback cocktail. “The Diamondback Cocktail” at cold-glass.com : All text and photos © 2015 Douglas M. Ford. All rights reserved. Your posts are so interesting – cocktails, history, culture and opinion! This looks great. I don’t have any Yellow Chartreuse on hand, but I’m tempted to try it with Strega. That would be an interesting experiment, I hope it works well. This sounds right up our alley, cheers! Cheers! I hope you enjoy it. Very much in agreement on this except just wanted to point out, Laird’s Applejack is blended, Laird’s Bonded is not (hence the use of the word bonded and straight, no additives, fed regulated aging, and 100 proof). Hey I love you man. Keep up the good writes! As far as the diamondback goes, I also don’t take to the trend towards higher proofs. I work at the green Russell and my bartender had a comment on this drink the other day I think you could appreciate. Basically he likes this drink with other fruit brandys. Chartreuses herbal sweetness with the bite from the rye is a perfect base layer to enhance a rich apricot brandy or stuff. That’s all I got today! That’s an interesting suggestion, substituting alternative fruit brandies. I look forward to giving that a try. Thanks! Nice history of an interesting cocktail. I find both versions have their place and perhaps the only thing I would differ on is the notion the rye whiskey means Rittenhouse. I presume you didn’t mean this quite so literally but I find playing with different ryes can really add some variety to this cocktail. Don’t get me wrong, I love Rittenhouse and use it often but it is one of the more bourbon-like ryes out there (although since the transition back to Heaven Hill/Bernheim made spirit it does seem to have a touch more earthy rye character to it, at least to me). Younger Willet MGP ryes (and other of the many MGP based ryes on the market) can work here as well as Willett’s own 2yo rye. The High West Double Rye is another nice option. On occasion I have even used Whistlepig to match the “sophistication” of the yellow (or green) chartreuse to good effect. As a matter of fact, I pretty much do reach first for Rittenhouse, as a sort of “house rye.” I haven’t tried Diamondback with the High West whiskies, but I do have the Double Rye in the pantry, and look forward to giving it a try, as an alternative. Thanks for the inspiration. I’ll have to try this when I eventually splurge on a bottle of chartreuse. Side note, how is the Cedar Ridge apple brandy? The distillery is very near my hometown (I live in southern Indiana now), and I’d love to know if it’s worth tracking down. When I was home for thanksgiving recently, their whiskies were everywhere but the less popular spirits will require some hunting. How does it compare to Laird’s bonded or calvados? Sorry for the delay in getting back to you, Monica. As for applejack, the only brand that seems to be widely distributed is Laird’s. What you might try though, instead of applejack, is a decent apple brandy, which will generally have a fuller, more interesting flavor. Laird’s makes such a thing, as do quite a few other US and foreign distillers —French Calvados is probably the most famous of the world’s apple brandies. As for the Grasshopper, my mother used to really love those things for dessert when we went out to restaurants. I don’t think I ever saw her make one at home. Hadn’t thought of that for a long time. Thanks!